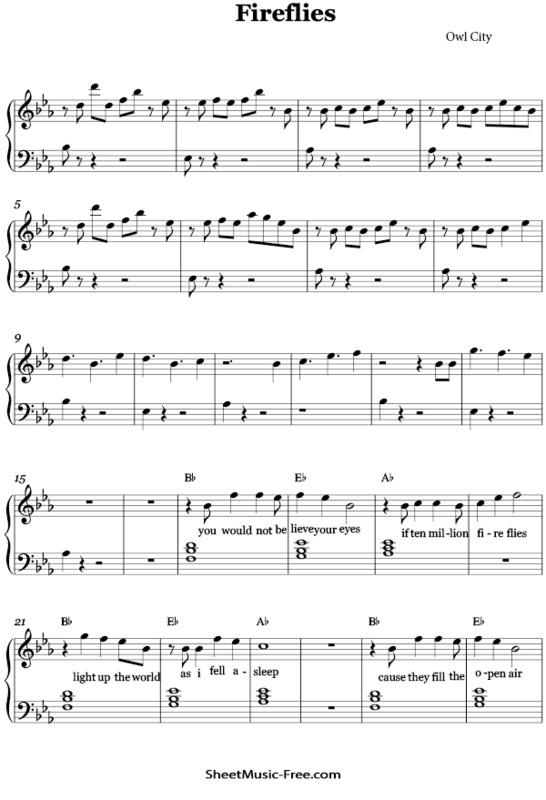 “Fireflies Sheet Music” by Owl City, “ Fireflies Sheet Music” for Piano , Original key: Eb Major, number of pages sheet music PDF: 2, Video and Lyrics song Fireflies Sheet Music. “Fireflies’” is the debut single from American electronica project Owl City’s album Ocean Eyes. Relient K vocalist Matt Thiessen is featured as a guest vocalist on the song. Adam Young described the song as “a little song about bugs and not being able to fall asleep at night.” The song is built around a “bleepy” synthline and includes lyrics about insomnia, fireflies and summer. Fireflies Sheet Music Owl City.